There are many types of cutting process done in different conditions. In such conditions along with the general requirements of the cutting tool, they need some unique properties. 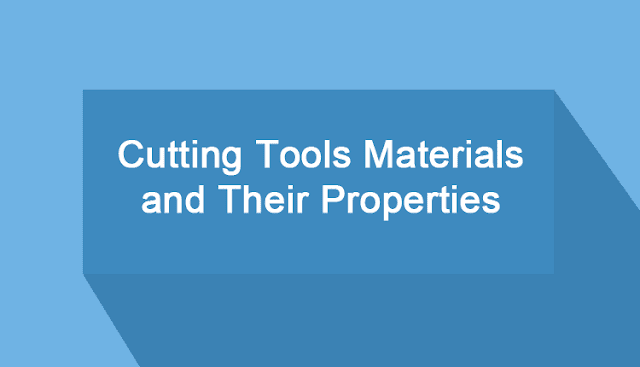 To achieve this properties the cutting tools are made up of different material. The material chosen for a particular application depends on the material to be machined, type of machining, quantity and quality of production. Carbon tool steel is one of the inexpensive metal cutting tools used for the low-speed machining operation. These plain carbon steel cutting tool have the composition of 0.6-1.5% carbon and very small amount of (less than 0.5 %) Mn, Si. Other metal like Cr, V are added to change the hardness and grain size. 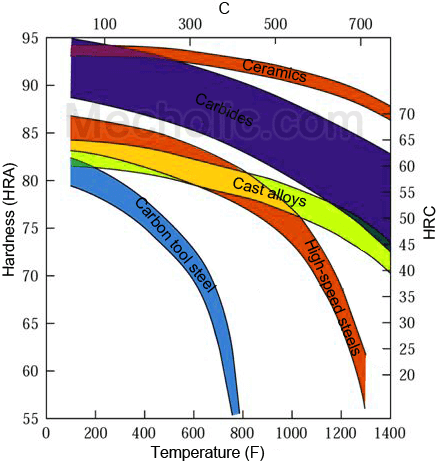 High carbon steels are abrasion resistant and have the ability to maintain sharp cutting edge. Carbon tool steels possess good machinability. This material loses their hardness rapidly at a temperature about 250°C. Therefore, it can’t use high-temperature application. It does not prefer in a modern machining operation. Carbon steel tool is used in twist drills, milling tools, turning and forming tools, used for soft material such as brass, aluminum magnesium, etc. This is a high carbon steel with a significant amount of alloying element, such as tungsten, molybdenum, chromium, etc. to improve hardenability, toughness and wear resistance. It gives a higher metal removal rate. It loses its hardness at a moderate temperature about 650°C. Therefore, a coolant should be used to increase tool life. It can use many times by re-sharpening. Some surface treatment is done on the HSS to improve its property. 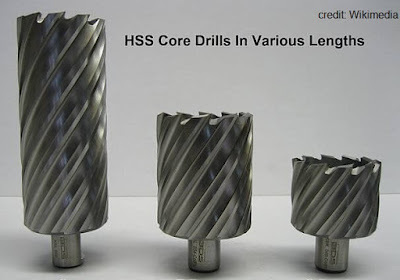 High-speed steel tools are used in drills, milling cutters, single point lathe tools, broaches. The cemented carbide cutting tool is produced by powder metallurgy technique. It consists of tungsten, tantalum and titanium carbide with cobalt as a binder (when the binder is nickel or molybdenum, then it is called cermet). Cemented carbide tools are extremely hard; they can withstand very high-speed cutting operation. Carbide tool does not lose their hardness up to 1000° C. A high cobalt tool is used for a rough cut while low cobalt tool used for finishing operations. Most common ceramic materials are aluminum oxide and silicon nitride. Powder of ceramic material Compacted in insert shape, then sintered at high temperature. Ceramic tools are chemically inert and possess resistance to corrosion. They have high compressive strength. They are stable up to temperature 1800°C. They are ten times faster than HSS. The friction between the tool face and chip are very low and possess low heat conductivity, usually no coolant is required. They provide the very excellent surface finish. It is the second hardest material after diamond. They are generally used in hand machines. They offer high resistance to abrasion and use as an abrasive in grinding wheels. Sharp edges are not recommended. It is the hardest material known and it is also expensive. It possesses very high thermal conductivity and melting point. Diamond offers excellent abrasion resistance, low friction coefficient and low thermal expansion. It is used in machining very hard material such as carbides, nitrides, glass, etc. Diamond tools give a good surface finish and dimensional accuracy. They are not recommended for machining steel. Another cutting tool material is Cast Cobalt Alloy. The wear resistance of this material is good but is not widely used because of low hardness.